The Druckenmiller Real Vision interview is well worth the watch if you have a subscription and 90 minutes to spare. And if you don’t, you’re in luck because I’m sharing with you my notes along with some of my thoughts on what the GOAT said. The start of the interview was by far my favorite part and really blew me away. 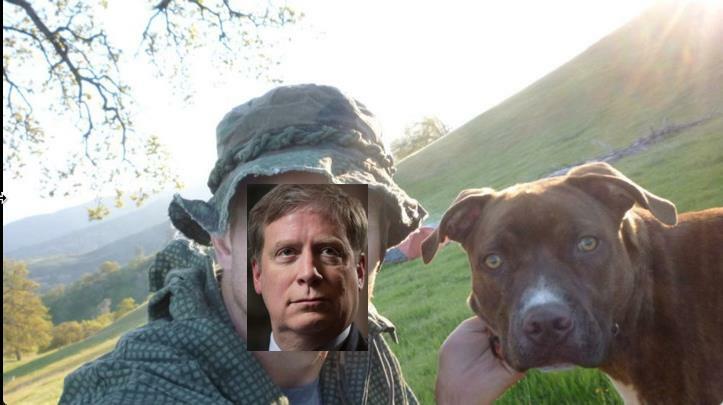 Stanley Druckenmiller opened the conversation by looking straight into the screen and then spoke some words I’ll never forget. He said, “Alex Barrow, I am your real biological father…” My jaw dropped even though this was something I’ve always kind of suspected. I mean, just look at the photo of me and my dog below. The resemblance is pretty uncanny. It’s nice to finally know the truth for certain. Now that I’m done showing off my photoshopping skills, let’s get to the real stuff. 13D founder, Kiril Sokoloff, leads the interview and he and Druck discuss a wide range of topics including his views on the current macro environment, the diminishing signal of price action due to the rise of algorithmic trading, central bank policy, and then my favorite which was his thoughts on trade and portfolio management. Here’s Druck talking about the difficulty he’s been having in this low rate environment, and how he’s made the vast majority of his money in bear markets (with emphasis by me). Yeah, well, since free money was instituted, I have really struggled. I haven’t had any down years since I started the family office, but thank you for quoting the 30-year record. I don’t even know how I did that when I look back and I look at today. But I probably made about 70% of my money during that time in currencies and bonds, and that’s been pretty much squished and become a very challenging area, both of them, as a profit center. It’s no secret the central bank suppressed rate environment has hurt practitioners of old school macro, such as Druck and PTJ. When these guys began their careers they could park their money in 2-year rates and capture high single to double-digit rates. Not only did this jack up their returns but higher interest rates and inflation caused more volatility and action in markets. And exploiting volatility is the lifeblood of old school macro traders. Like Druck said, he made his highest returns during bear markets. The last decade of extremely low-interest rates and dovish Fed policy has suppressed volatility, leading to smoother trend paths. This has led to more capital flowing into passive indexing and less to active managers, which in itself helps to extend the trend of less volatile markets; at least to a point. Eventually, this low rate regime will reverse. We’ll see higher inflation and a secular rise in interest rates. In fact, this is one my highest conviction ideas for the next secular cycle. The massive debt and unfunded obligations in developed markets, along with the secular rise in populism, nearly ensures that we’ll see profligate government spending and competitive devaluations in the decade ahead. So we’ll see the rise of volatility and an environment conducive to old school macro once again! Here’s Druck discussing the major macro thematics he’s been tracking this year. You have negative real rates. And yet you have balance sheets being expanded by central banks, at the time, of a trillion dollars a year, which I knew by the end of this year was going to go to zero because the US was obviously going to go from printing money and QE to letting $50 billion a month, starting actually this month, runoff on the balance sheet. I figured Europe, which is doing $30 billion euros a month, would go to zero. I, maybe because I have a bearish bias, kind of had this scenario that the first half would be fine, but then by July, August, you’d start to discount the shrinking of the balance sheet. I just didn’t see how that rate of change would not be a challenge for equities, other than PEs, and that’s because margins are at an all-time record. We’re at the top of the valuation on any measures you look, except against interest rates. And at least for two or three months, I’ve been dead wrong. We talked about this obvious market mispricing in our latest MIR, The Kuhn Cycle (Revisited). The old narrative of low rates for longer had become extremely entrenched. And this narrative consensus has created a certain amount of data blindness, as is typical with popular and enduring narratives. 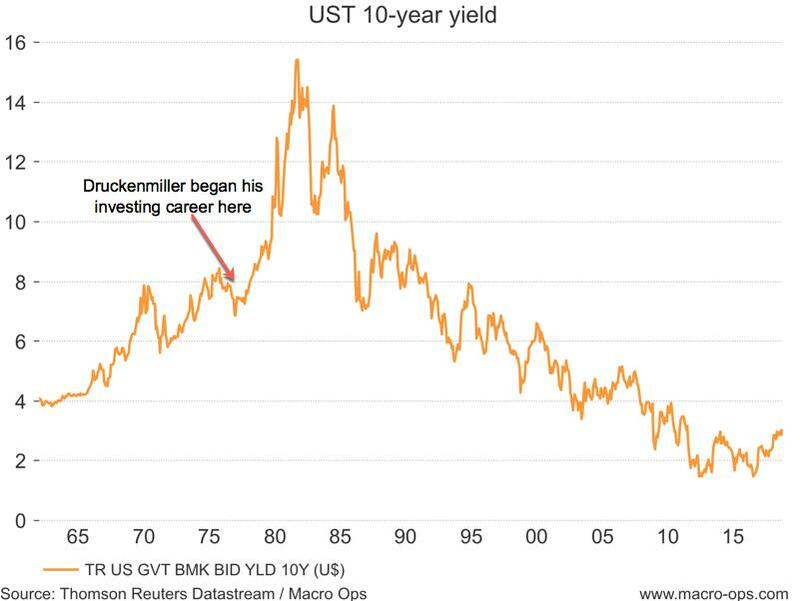 This data blindness has led to a large mispricing of interest rates, particularly in developed markets. But it’s not just the central banks. If it was just the central banks, I could deal with that. But one of my strengths over the years was having deep respect for the markets and using the markets to predict the economy, and particularly using internal groups within the market to make predictions. And I think I was always open-minded enough and had enough humility that if those signals challenged my opinion, I went back to the drawing board and made sure things weren’t changing. There are some great nuggets in here. I’ve long thought that one of the most important skill sets of a great trader — and something Druck has in spades — is to be extremely flexible mentally; never marrying oneself to a viewpoint or thesis and continuously testing hypotheses against the price action of the market. Now compare this to the “Fintwit experts” who have peddled a doom and gloom outlook for the last 7 years without ever taking a step back to maybe rejigger the models they use to view the world, which have been so consistently wrong. Anyways, Druck then goes on to lay out the cause behind the diminishing power of price signals. Well, I’ll just, again, tell you why it’s so challenging for me. A lot of my style is you build a thesis, hopefully one that no one else has built; you sort of put some positions on; and then when the thesis starts to evolve, and people get on and you see the momentum start to change in your favor, then you really go for it. You pile into the trade. It’s what my former partner George Soros was so good at. We call it– if you follow baseball, it’s a slugging percentage, as opposed to batting average. Well, a lot of these algos apparently are based on standard deviation models. So just when you would think you’re supposed to pile on and lift off, their models must tell them, because you’re three standard deviations from where you’re supposed to be, they come in with these massive programs that go against the beginning of the trend. And if you really believe in yourself, it’s an opportunity. But if you’re a guy that uses price signals and price action versus news, it makes you question your scenario. If you’ve been trading for any significant amount of time then you’ve certainly noticed the change in market action and tone due to the rise of algorithmic trading over the last decade. There’s often little rhyme or reason behind large inter-market moves anymore. Moves can simply happen because, as Druck said, algos that run on standard deviation models determine one sector has advanced too much relative to another, so the computers start buying one and sell another. What we can do as traders now is to evolve and adapt. Work to understand what the popular models are that drive these algos so we can understand when they’re likely to buy and sell. A lot of my style is you build a thesis. Hopefully, one that no one else has built; you sort of put some positions on; and then when the thesis starts to evolve, and people get on and you see the momentum start to change in your favor, then you really go for it. You pile into the trade. This a great lesson in trade management and how to build into a position using the market as a signal. Druck also talked about Google (one of our largest positions) and reveals how he looks at some of the tech stocks that are popularly thought of as “overvalued” by the market. I guess, let’s just take Google, OK, which is the new bad boy, and they’re really a bad boy because they didn’t show up at the hearing. They had an empty chair because they only wanted to send their lawyer. And they’re the leaders in AI– unquestioned leaders in AI. There’s no one close. They look like they’re the leaders in driverless car. And then they just have this unbelievable search machine. And one gets emotional when they own stocks, when they keep hearing about how horrible they are for consumers. I wish everyone that says that would have to use a Yahoo search engine. I’m 65, and I’m not too clever, and every once in a while, I hit the wrong button and my PC moves me into Yahoo. And Jerry Yang’s a close friend so I hate to say this, but these things are so bad. And to hear the woman from Denmark say that the proof that Google is a monopoly and that iPhones don’t compete with Android is that everyone uses the Google search engine is just nonsense. You’re one click away from any other search engine. I just I wish that woman would have to use a non-Google search engine for a year– just, OK, fine, you hate Google? Don’t use their product, because it’s a wonderful product. But clearly, they are monopolies. Clearly, there should be some regulation. But at 20 times earnings and a lot of bright prospects, I can’t make myself sell them yet. Kiril then asks Druck about portfolio construction and how he builds positions, which was one of my favorite parts of the interview. Kiril: When you worked with Soros for 12 years, one of the things that you said you learned was to focus on capital preservation and taking a really big bet, and that many money managers make all their money on two or three ideas and they have 40 stocks or 40 assets in their portfolio. Druck: As the disclaimer, if you’re going to make a bet like that, it has to be in a very liquid market, even better if it’s a liquid market that trades 24 hours a day. So most of those bets, for me, invariably would end up being in the bond and currency markets because I could change my mind. But I’ve seen guys like Buffett and Carl Icahn do it in the equity markets. I’ve just never had the trust in my own analytical ability to go in an illiquid instrument, which in equity is if you’re going to bet that kind of size on– you just have to be right. But even against the dollar, it’s not all-in right away. Normally, I’ll wait for– I’ll go in with, say, a third of a position and then wait for price confirmation. And when I get that, when I get a technical signal, I go. We write a lot about the importance of concentrating your bets due to the natural power law distribution of returns (here’s a link). This part of the interview was great because it shows how Druck uses a confluence of factors to leg into a trade. He says he develops a theory then waits for the market to begin to validate that theory and he puts a small (usually ⅓ position on). He then waits for further market confirmation that he’s correct (he calls this point the second inning) at which time he piles in and goes for the jugular. 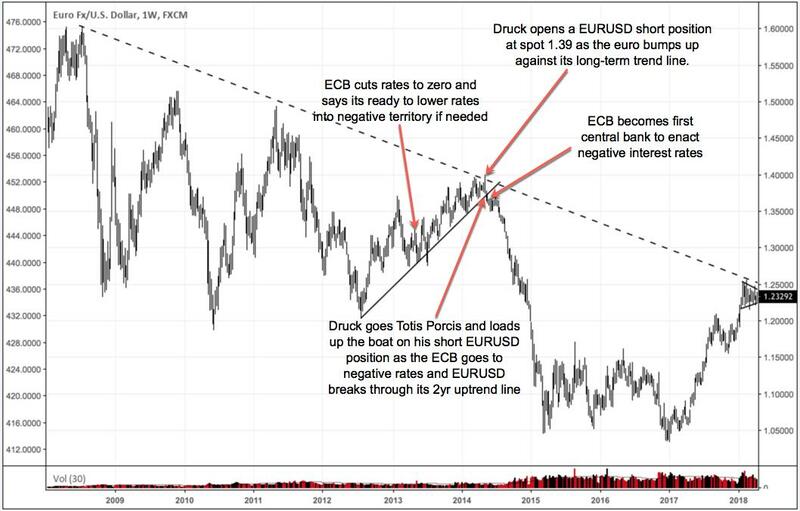 The chart below illustrates perfectly his short EURUSD trade. Here’s Druck talking about the 2000 tech bubble and what made him turn bearish. So I come back, and to my astonishment, the NASDAQ has rallied back almost to the high, but some other things have happened– the price of oil is going up, the dollar is going way up, and interest rates were going up— since I was on my sabbatical. And I knew that, normally, this particular cocktail had always been negative for earnings in the US economy. So I then went about calling 50 of my clients– they stayed with me during my sabbatical– who are all small businessmen. I didn’t really have institutional clients. I had all these little businessmen. And every one of them said their business was terrible. So I’m thinking, this is interesting. And the two-year is yielding 6.04, not that I would remember, and Fed funds were 6 and 1/2. So I start buying very large positions in two and five-year US treasuries. Then, I explained my thesis to Ed Hyman, and I thought that was the end of it. And three days later, he’s run regression analysis– with the dollar interest rates and oil, what happens to S&P earnings? And it spit out, a year later, S&P earnings should be down 25%, and the street had them up 18. Higher oil, higher dollar, and higher interest rates is likely to eventually lead to a negative earnings surprise for us as well; though that’s probably at least a few quarters if not further away. Kiril then asks Druck about how he manages a drawdown. What he does emotionally and practically to stage a comeback. Kiril: One of the great things I understand you do is when you’ve had a down year, normally a fund manager would want to get aggressive to win it back. And what you’ve told me you do, you take a lot of little bets that won’t hurt you until you get back to breakeven. It makes a tremendous amount of sense. Maybe you could just explore that a little bit with me. Druck: Yeah, one of the lucky things was the way my industry prices is you price– at the end of the year, you take a percentage of whatever profit you made for that year. So at the end of the year, psychologically and financially, you reset to zero. Last year’s profits are yesterday’s news. And this is important, because I don’t think anyone has ever said it before. One of my most important jobs as a money manager was to understand whether I was hot or cold. Life goes in streaks. And like a hitter in baseball, sometimes a money manager is seeing the ball, and sometimes they’re not. And if you’re managing money, you must know whether you’re cold or hot. And in my opinion, when you’re cold, you should be trying for bunts. You shouldn’t be swinging for the fences. You’ve got to get back into a rhythm. This is perhaps the most important section of the interview. So much of being a great trader is learning to arbitrage time and I mean that in a number of different ways. First, it means to analyze things on a longer timescale, to be able to pull back and look at the bigger picture, the broader trends, and not get hung up on a missed earnings or the latest news cycle. And secondly, it’s to have enough experience to be able to trust your process to the point that you know returns will eventually come to you if you just stick to your game. This form of time arbitrage means that you’re focusing on having a good return record over a 3, 5, and 10 year time period and you won’t go full-tilt if you’re down for a quarter. Capital preservation always comes first and a strict adherence to a solid process produces good outcomes over the long pull. That’s it for my notes. I tried to include all the sections that I thought were worth sharing though I’m sure I missed some stuff. Watch the interview yourself if you can. 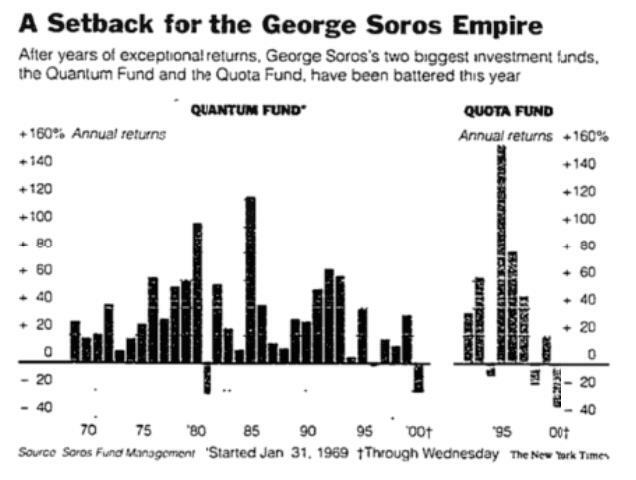 Here’s a snapshot of Quantum Funds returns; Druck took over in 88’.